It is summer, or at least it is on the continent I’m on, at that means warmer days, outdoor workouts, and more dips in the pool. Unfortunately, it can also mean that you CGM sensor tape starts to peel, which could mean a shorter lifespan for your sensor. Obviously, nobody wants that, so I’ve tested different brands of Dexcom G5 patches to see if they were comfortable to wear and could prolong my sensor lifetime. Why Dexcom G5 tape, you might ask? Well, that’s the type of CGM that I’ve been wearing up until recently when I upgraded to the Dexcom G6. 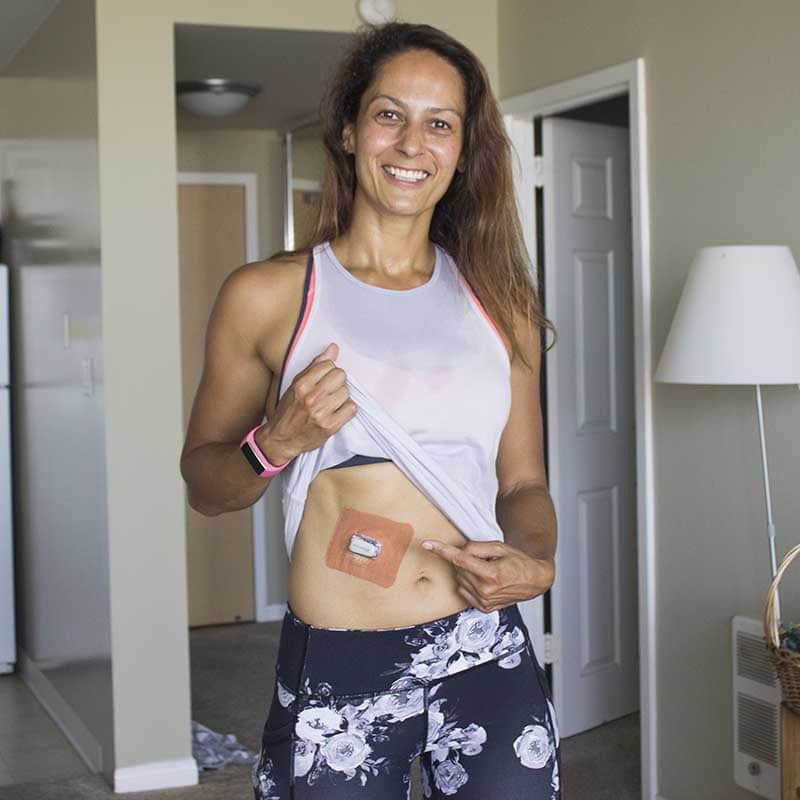 However, I’ve found that the patches also work for the Dexcom G6 (most of the brands I tried offers patches for both Dexcom, Libre, Eversense, and Medtronic, as well as pump and BG meter adhesives). Since I’ve only tested a handful of the patches available, feel free to add your favorite CGM tape in the comment below. I should also mention that many people add an adhesive (like skin glue) to their skin under the tape for the sensor to stick longer. I’ve never had huge success with the additional adhesive and I didn’t wear it with any of the CGM patches I used in this test. What’s important in a CGM patch? In general, I don’t wear a sensor longer than 7-10 days (which is also what the Dexcom G5 and G6 are approved for). The primary reason I only wear the sensor for 7-10 days is that I have fairly sensitive skin and wearing it longer can be an itchy and painful experience. I know that some of you wear the sensor much longer than I do, but, unfortunately, I can’t tell you how these patches perform past 10 days. This was the first sensor tape I came across when I started wearing my Dexcom and it’s by far the most durable of all the patches I’ve tried. It actually sticks so well to the skin that it can be hard to get off. I’ve had to use glue remover (TacAway works well and is also great for removing glue residue) to make removing the patch less uncomfortable. Needless to say, the GrifGrips will easily stay on for 7-10 days. The grips are made of a material much like sports tape, so it doesn’t feel restrictive or stiff and the skin can breathe because you won’t sweat under the grip but through it. If you want your grip to be colorful, GrifGrips come in a variety of colors and shapes, all in the same fabric-like sports tape material. I haven’t tried their multicolored designs, which are made of a different material, so I can’t say if they stick as well. Prices start at $3.55 for a 3-pack and vary by design and volume of patches you choose to purchase. You can find all the design on the GrifGrip website as well as a selection on Amazon. The oval sports tape that I most often pick is $20 for 20-grips on Amazon ($1/patch). The Skin Grip CGM patches are very similar to GrifGrips. They are also made of a soft fabric-like material. However, it’s a much smaller company and they only offer the oval sports tape in a ‘tan’ color. Unfortunately, their definition of tan is not the same as my skin color. That aside, what really sets the Skin Grips apart from GrifGrips is the peel-off paper. The paper is precut into 4 pieces, so instead of having to peel it all off at once and having to manage a very sticky grip (I’ve messed up a few grips because they got glued to themselves before I got them on my skin), you can simply loosen up the edges, place the grip over the sensor, and then remove the paper. Simple but brilliant. I’ve found that the material feels slightly lighter than the GrifGrips but sticks just as well. It also doesn’t irritate my skin. As mentioned, you can only get one shape and one color so they don’t have a lot of variety to offer at this point (according to the website, they’ll have new designs coming). Prices are very reasonable, with a 20-pack of patches being $15.99 ($0.8/patch) and a 50-pack being $34.99 ($0.7/patch) on their website and $20 for a 20-pack on Amazon. These CGM adhesives are fun and colorful, and you can get a broad range of cute designs. They’re predominantly oval patches but you can also get a few other fun shapes. 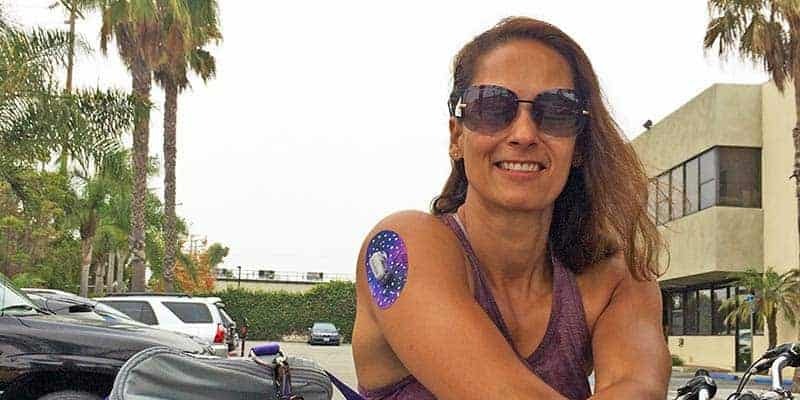 I tried their “The Original 5″ Dexcom Guards”, which has both an owl-shaped and a heart-shaped patch, which some might argue cater more to the younger audience (but who cares, I’m young at heart!). This is definitely for the person who’s not shy about showing off their diabetes gear and I really enjoyed wearing them. The major downside to these grips is that they are printed on material that feels more like paper than sports tape. They felt stiffer than both GrifGrips and Skin Grips and they didn’t last me more than a few days. My take is that these CGM patches are a way to beautify the sensors rather than making sure they stick longer. They are quite a bit more expensive than the patches above with an average patch price of $3/patch when you 5-packs and $4 for a single patch. 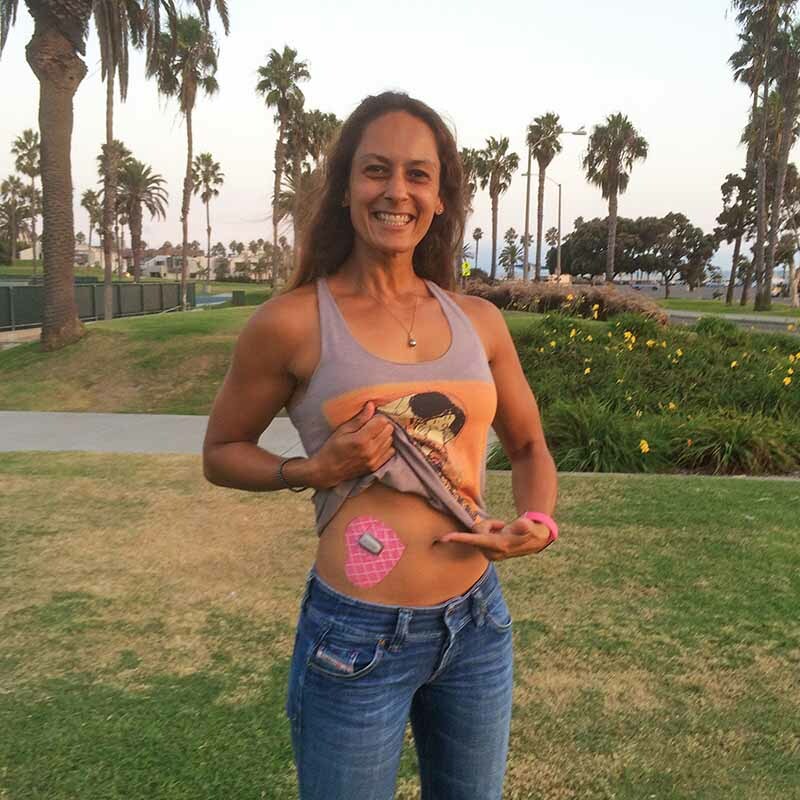 Like the ExpressionMed CGM patches, Pump Peelz brings the fun when it comes to designs. They have a larger selection of print designs than any of the other brands but only come in a single oval shape. Much like ExpressionMed, the prints are on material that feels more like paper than fabric, so they also tend to wrinkle a little and don’t last me as long as GrifGrip and Skin Grips. However, if you’re looking for a way to jazz up your CGM for any occasion, you can find it here. They’ll even print your own design if that’s what you prefer. 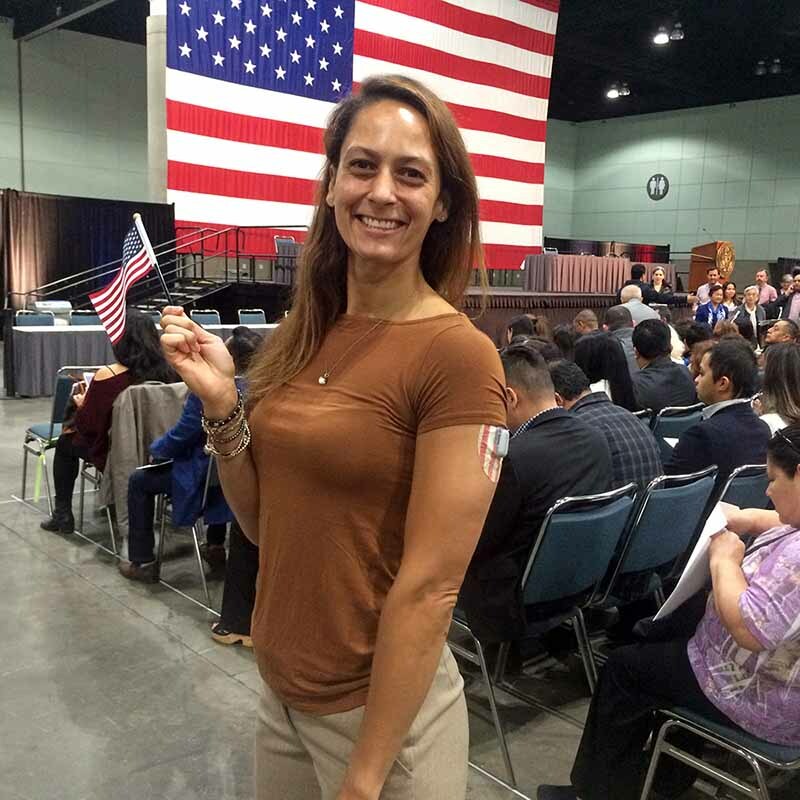 I wore their American flag when I became a US citizen and thought that was very appropriate. The designs seem slightly more mature than ExpressionMed. I had a lot of fun wearing them and would definitely buy them again. But mainly to wear in the wintertime because they don’t handle heat (and sweat) as well as some of the other patches. A patch is $3, and you pick as many different designs as you like on their website. The transparent adhesives like Tegaderm and Flexifix are not really patches but rather medical adhesives/tape (I’ve written about them before so I felt it was appropriate to add them here). I can’t help getting the feeling that I’m putting office tape on my body whenever I’ve used them. Since it’s made from a plastic material, my skin cannot breathe, and it usually doesn’t last long since sweat will pool up under the adhesive rather than go through it like it does with the other CGM patches. I find that my skin becomes red and irritated very quickly, and the only upside I see to this solution is that it’s relatively cheap and see-through. Flexifix was the last brand I tried and I received a large roll of tape, which can easily be cut into whatever shape you want. That is, of course, an advantage if you don’t like the larger CGM patches available (I have written about how to cut the tape here). If you want to try it out, you can find it on Amazon. 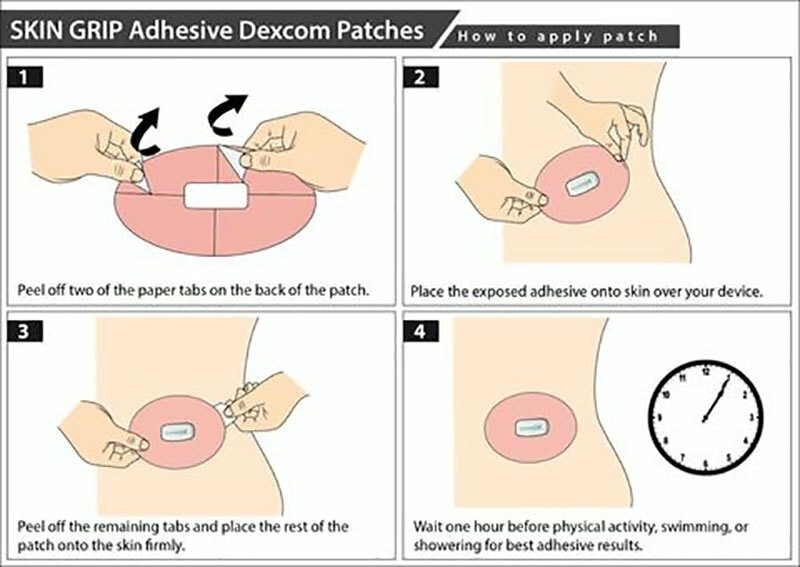 Which Dexcom patch would I recommend? If the goal is to make the Dexcom sensor stay on longer, and you don’t care about colors, shapes, and designs, I’d recommend the Skin Grips. They slightly outperform GrifGrips at the same price, they’re easy to apply, and they stick. Although super fun and cute, the ExpressionMed patches and the Pump Peelz are more a way of beautifying your CGM sensor than a way to truly secure the sensor and prolonging the lifetime. That doesn’t mean I won’t wear them (I actually really like how fun they are), but, for me, they’ll just be more of a winter wearable. If you are looking for the best combo of practicality and design, I would recommend starting in the GrifGrip store. Their patches work great and they are always coming out with new designs. My doc solved the skin irritation issue easily. Go to any drugstore and get 1% Hydro-cortisone Anti-itch Cream. Put a very thin coat on the skin first. I actually take a tissue and wipe lightly to thin it down. The skin irritation will not appear, even for the full 10 days for the G-6 or the 14 days I used to run the G4 on. Great stuff! Dexcom just sent me a new transmitter and they enclosed a 10-pack of Dexcom Overpatch. I have been using SkinTac which has worked very well for me, but I have to draw an oval on my skin to avoid getting skintac on the sensor. I just called Tech Support and she said they provided these free of charge upon request. I hav enot used one yet. Do you have any experience with them? Pros or Cons? I had problems with my sensor/transmitter staying on. Live in FL & am an active person who tends to sweat a lot. When replacing my sensor, the service rep informed me that they would include a pkg of overpatches to try. Have not had a problem any longer. The product is Dexcom Overpatch MT22994 oval. No skin irritation after swimming, pool & the Gulf (salt water), playing tennis & golf, hiking, kyakking and sweating! Easy removal, too. Thank you, Christel! You really took a lot of time to review different products, and I (as a new G6 wearer) appreciate it! THANK YOU SO MUCH FOR THIS POST. It is so hard to find reviews that are well written and clear for medical supplies. I have been looking up which type of patch to get for my Dexcom, and looking on Amazon the Simpatch has really good reviews. I was wondering if you have ever tried it? I recommend trying patches from THE SUGAR PATCH. They are made with medical grade hypoallergenic tape that has extended wear adhesive and will stick through swimming, bathing, workouts, and sports. They also come in a variety of designs to fit any age and lifestyle. 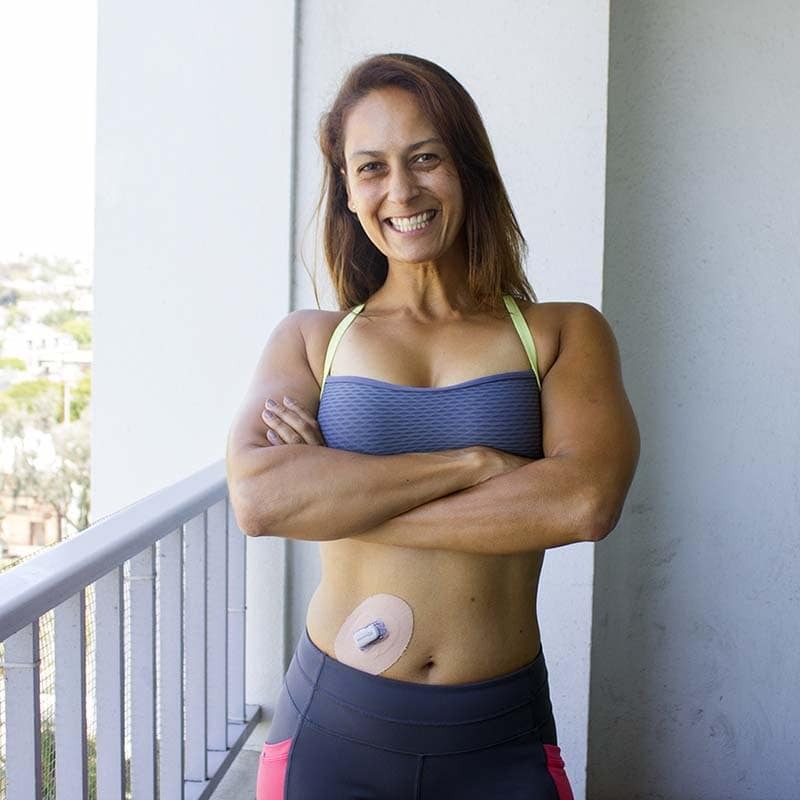 They are made to fit Dexcom and Medtronic CGM sensors, Omnipod Insulin Pumps, and infusion sites. I want the patch you have on in the first picture. The stars or nigh sky theme, where did you get that one? I called Dexcom and was told that the adhesive is the same. It feels different though, it won’t stick to my skin as well as the G5 did. Any recommendations for Judo athletes? Grappling is such a task. You could try a larger sturdy tape like “Rock tape”. Alternatively, maybe look into some sort of compression band that you can take on and off? Christel – Dexcom is finally providing their own stickers/patches for prolonging the CGM patch stick life. They are fantastic and stick for as long as you want them to last. They are oval and cover an additional few mm of space over the normal patch. You can get them by calling Dexcom and asking for them. There is no charge! They come in packs of ten. Hi – yes, while writing this I’m actually on hold trying to get through to Dexcom. I appreciate that they do this but hate that it’s taking +30-min of my day being on hold trying to get through to them. Any tips on how to file the warranty claim without having to call them? That’s some cute designs, thanks for adding this resource to the list! They come in a resealable aluminium package. I currently use Simpatch but they give me a rash. I have to use benedryll gel before I apply it or I get a rash that is just horrible to deal with. I used GrifGrips for about a year, but always had issues with the edges becoming unglued, they stayed damp after showering, leaving wet marks on my shirts, etc. I’ve since discovered DexTape, which is transparent, breathable and sticks well, even after 10 days. I’m an active cyclist and find them much more comfortable than GrifGrips. The DexTape survives swimming, excessive heat and sweating. Others may have different results, but thses work very well with my Dexcom G5. Thanks Bob, I’ll definitely check them out!